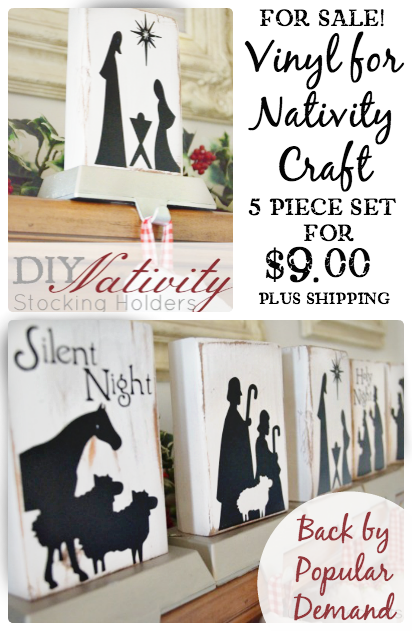 Each year I am blown away at the requests I have to sell the vinyl for these DIY NATIVITY STOCKING HOLDERS. Thank you so much for all the sweet comments and requests. I love getting your emails! How soon will I receive my order? or When do you ship the order? -I ship the orders out 7 days after I receive the paid invoice. How many pieces are in the set? -The $9.00 charge includes all 5 pieces in the original tutorial. My family is quite large. Do you offer a 6th piece? -Yes! I have another shepherd boy with a lamb. Before you purchase just send me an email at bandbnicholedesigns@gmail.com and I will send you a personalized invoice. -I do not offer discounts for multiple orders, but I do combine shipping. How big are the vinyl pieces? -They are 3″x 4″…read more about that in the original tutorial. Can I order it in different colors or do you only offer black? -we are only offering the black vinyl sets this year. Simply click the button HERE to purchase. If you have a question that isn’t answered here, please feel free to send me an email (beckymarie8@gmail.com). Next Post: Tons of Free Chalkboard Fonts and Dingbats! I would like to purchase the nativity vinyl, but do not see the buy it button. Do I need to subscribe first? Really love this idea and can’t wait to make my own. You can contact Becky at her email becky@u-createcrafts.com and she’ll be able to answer your questions! Thanks! I have been looking for cute Christmas stocking holders AND have also been looking for a Nativity set so these will be perfect. Just put in my order now! : ) Thank you thank you. I am so glad you love them. Thanks so much for your comment! Just ordered and am so excited to add this to my collection! Hi! I just ordered 5 sets in black, but I realized I had my old address tied to my PayPal account. I am wondering if you could contact me so I can get you my new address. Thanks! I purchased three and I am putting them together now. I have got the vinyl attached to the wood block. If children will be touching the blocks would it be good to put some kind of sealer over the vinyl and block? Or would that ruin the vinyl? Just trying to figure out if I can make these solid enough that children can touch. Thank you for the quick mailing. I love them so much I ordered three more. Need to get back painting so I can get these finished! Can we order the vinyls in different size. I was thinking of making the blocks 6 inches instead of 4″. I would like to place the vinyl on several window panes in an old window. Do you think they would work on glass? And how hard would it be to remove? It would definitely work on glass. I would just suggest not using permanent vinyl and it will be a cinch to remove!